Shazam Family Giant thunders through the Junior Journals! When Freddy Freeman says "Captain Marvel", he transforms into the World's Mightiest Boy. 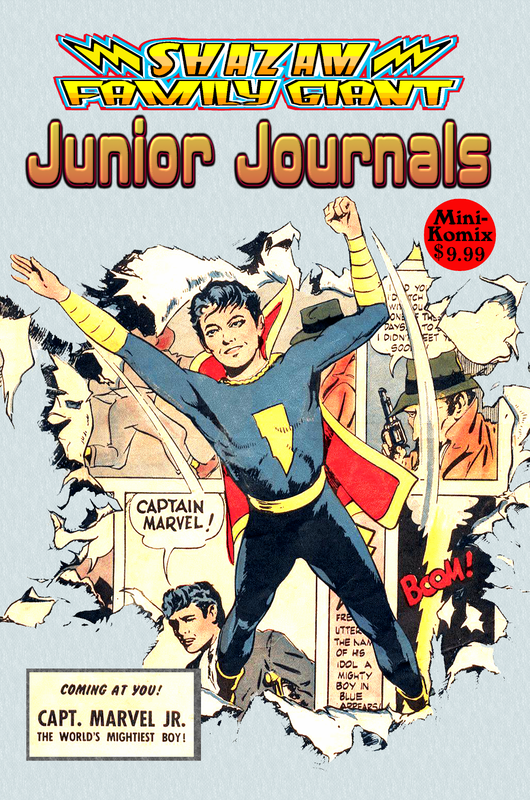 Now as Captain Marvel Jr., he goes into business with the rest of the Marvel Family. He also flies solo when he smashes sea monsters, fights freaks, catches clowns, punches pirates, duels a demon, attacks the Arabian Knights, and spites Sivana Jr. 100 Big Pages of the original titanic teen of comics! You can get this in print through us, plus at Lulu, also for download at Drive Thru Comics, and as part of the Shazam Family Giant Collection Bundle.